In 1939 Lee Hoi Chuen, a Chinese opera singer, brought his wife Grace and three children from Hong Kong to San Francisco, California, while he performed in the United States. On November 27, 1940, the Lees had another son. His mother called the boy Bruce because the name meant "strong one" in Gaelic. His first film appearance, at the age of three months, was in Golden Gate Girl (1941). Although Hong Kong was occupied by Japanese troops, the Lees then decided to return home, where Lee's film appearances continued, numbering around twenty by the time he graduated from high school. As a teenager Lee was both a dancer, winning a cha-cha championship, and a gang member, risking death on the Hong Kong streets. To improve his fighting skills, he studied the Chinese martial arts of kung fu. He absorbed the style called wing chun, which was developed by a woman named Yim Wing Chun, and he began adding his own improvements. Lee's film career continued, and he was offered a large contract. But when he got into trouble with the police for fighting, his mother sent him to the United States to live with friends of the family. After finishing high school in Edison, Washington, Lee enrolled at the University of Washington, supporting himself by giving dance lessons and waiting tables. While teaching kung fu to fellow students, he met Linda Emery, whom he married in 1964. Lee developed a new fighting style called jeet kune do and opened three schools on the West Coast to teach it. He also landed a part in the television series The Green Hornet as Kato, the Hornet's assistant. Kato used a dramatic fighting style quite unlike that which Lee taught in his schools. The show was cancelled after one season, but fans would long remember Lee's role. Lee went on to appear on shows such as Longstreet and Ironside and in the film Marlowe (1969), playing a high-kicking villain. Unhappy with the number and quality of roles available to Asian Americans in Hollywood, Lee and his family, including son Brandon and daughter Shannon, moved back to Hong Kong in 1971. Lee soon released the movie known to U.S. audiences as Fists of Fury. The story, featuring Lee as a fighter seeking revenge on those who had killed his kung fu master, was not very original, but with his graceful movements, his good looks and charm, and his acting ability, Lee was a star in the making. Fists of Fury set box-office records in Hong Kong that were broken only by Lee's next film, The Chinese Connection (1972). Lee established his own film company, Concord Pictures, and began directing movies. The first of these would appear in the United States as Way of the Dragon. Lee was excited about his future. He told a journalist, "I hope to make … the kind of movie where you can just watch the surface story, if you like, or can look deeper into it." Unfortunately, on July 20, 1973, three weeks before his fourth film, Enter the Dragon, was released in the United States, Lee died suddenly. The official cause of Lee's death was brain swelling as a reaction to aspirin he had taken for a back injury. But there were rumors that he had been poisoned by either the Chinese mafia or powerful members of the Hong Kong film industry. Others said that Lee's purchase of a house in Hong Kong had angered neighborhood demons, who then placed a curse on him to last for three generations. This theory was revived on June 18, 1993, when Lee's son Brandon also died under strange circumstances. While filming the movie The Crow, he was shot by a gun that was supposed to contain only blanks (which produce the appearance of a gunshot but cause no bullet to be fired) but in fact had a live round in its chamber. Bruce Lee's movies, though few in number, created a new art form. By the 1990s Enter the Dragon alone had earned more than $100 million, and Lee's influence could be found in the work of many Hollywood action heroes such as Jean-Claude Van Damme, Steven Seagal, and Jackie Chan. In 1993 Jason Scott Lee (no relation) appeared in Dragon: The Bruce Lee Story. Bleecker, Tom. Unsettled Matters: The Life and Death of Bruce Lee. Lompoc, CA: Gilderoy Publications, 1996. Clouse, Robert. Bruce Lee: The Biography. Burbank, CA: Unique Publications, 1988. Hoffman, Charles. Bruce Lee, Brandon Lee, and the Dragon's Curse. New York: Random House, 1995. Jahn, Michael. Dragon: The Bruce Lee Story. New York: Jove Books, 1993. Lee, Bruce. Bruce Lee: Artist of Life. Compiled and edited by John Little. Boston: Tuttle, 1999. Roensch, Greg. 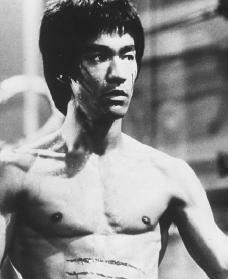 Bruce Lee. New York: Rosen Pub. Group, 2002. I AM VERY BIGGEST FAN OF HIM. HIS LOOKING VERY INNOCENT AND VERY NICE GUY. Why Bruce Lee's mother send him U.S.what exactly happened? The death of Brandon Lee was explained on an episode of Unsolved Mysteries. The prop gun fired said blank round BUT it got jammed in the chamber, resulting in the next blank round fired to use the gunpowder from the empty round to shoot out of the prop guns’ chamber like it was a live round, thus unfortunately killing him 😢.